As it was my birthday earlier this week I thought I'd share a photo of me as a kitten today. Mum really likes this picture of me too. Inspired by the blue blanket, she played around with PICMONKEY and came up with this delight. By the way, if you haven't seen our new header already, we have changed the name of this blog to Athena and Marie. The url remains the same though, so don't worry about finding us! Disclosure: This post contains some affiliate links. Full disclosure policy. That is *so* beautiful, Athena! Athena! Yous IS a goddess, even when yous was a baby!!! What a lovely picture, Athena! Happy Caturday. Great picture!!! We're sorry we missed your birthday and we hope it was a pawsome one! This photo makes you look like the star you are! Very interesting effect. Happy Birthday. What a cute kitten! You’re new blog header looks nice. We like the blue glow to the photo. A belated happy birthday. 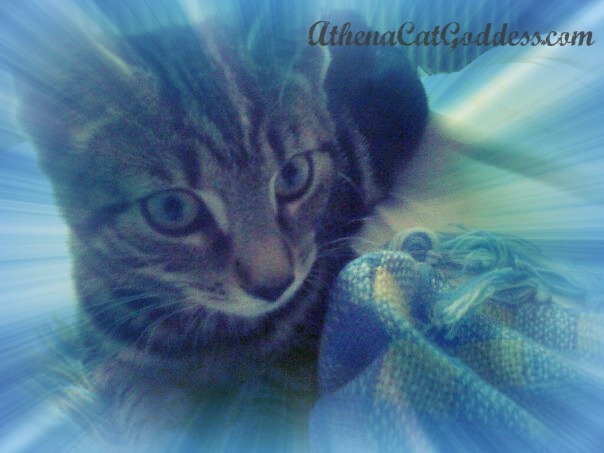 Athena, your photoart looks dreamy....we love it! Thank you for your wonderful comments and love! Thanks fur the blog hop! !